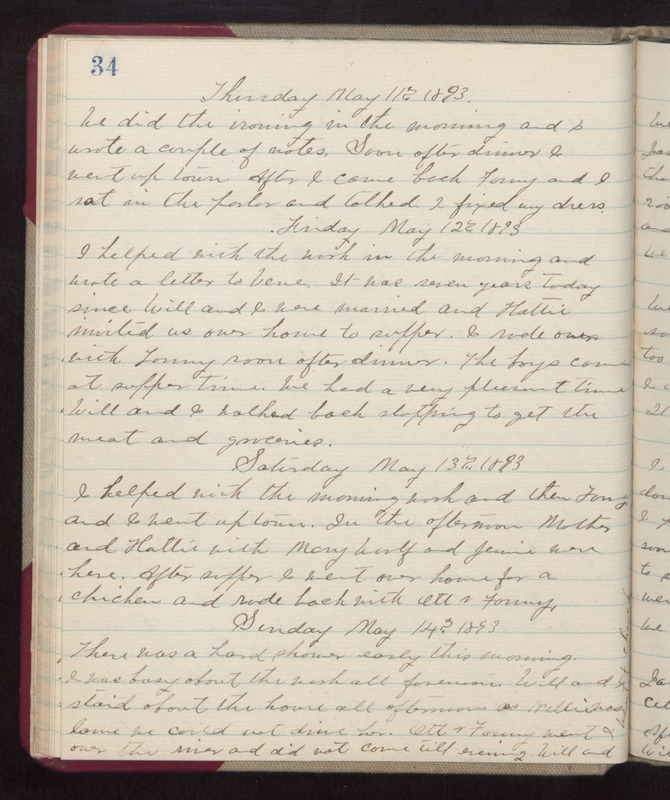 Thursday May 11th 1893 We did the ironing in the morning and I wrote a couple of notes. Soon after dinner I went up town. After I came back Fanny and I sat in the parlor and talked. I fixed my dress. Friday May 12th 1893 I helped with the work in the morning and wrote a letter to Vene. It was seven years today since Will and I were married and Hattie invited us over to supper. I rode over with Fanny soon after dinner. The boys came at supper time. We had a very pleasant time. Will and I walked back stopping to get the meat and groceries. Saturday May 13th 1893 I helped with the morning work and then Fanny and I went up town. In the afternoon Mother and Hattie with Mary Woolf and Jennie were here. After supper I went over home for a chicken and rode back with Ott & Fanny. Sunday May 14th 1893 There was a hard shower early this morning. I was busy about the work all forenoon. Will and I staid about the house all afternoon as Nellie was lame we could not drive her. Ott & Fanny went over the river and did not come till evening. Will and I went to church.